"The biggest stumbling block to the project was the computer’s interface. 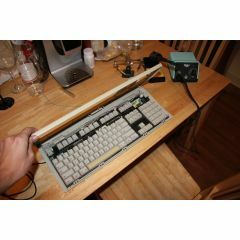 The Apple Extended Keyboard II is from the days of ADB, or Apple Desktop Bus. The internet revealed two possible solutions: An expensive and sometimes-hard-to-find adapter by Griffin, or a $16 microcontroller and some DIY elbow grease. Naturally, I chose the latter." 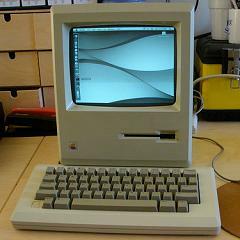 "Add a bootable ROM disk to your vintage compact Macintosh! Replace the startup sound, change the Happy Mac icon, edit the ROM disk, or tweak the ROM code behavior. 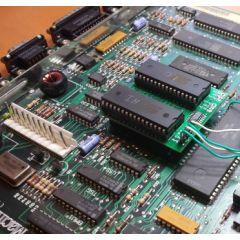 The Mac ROM-inator Kit replaces the stock 64K or 128K of ROM in a compact Macintosh with a full 1 MB of flash memory. Once installed, the flash ROM’s contents can be updated from within the running Macintosh, allowing for crazy customization experiments." 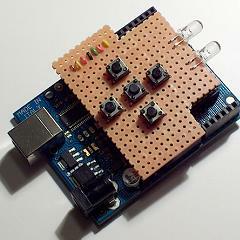 If you ever thought those little AVR microcontrollers were not so powerful, this project should prove you wrong. 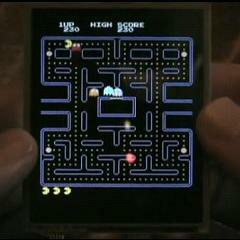 This project uses a 12 Mhz AVR to output complex grahics and basically an operating system to a touch screen LCD very similar to an iPhone. Hardware schematics & source code are all there for you. Today’s project shows you how to make a hand crank that can recharge your Ipod. Obviously you’ll run out of energy after a few minutes, but you’ll be able to listen to music while you’re at it. The write-up is very detailed, take a look. We’ve seen a few of these before but this mobile iPod battery pack is definitely the simplest. It just uses two 9v and two AA’s. This method could potentially (but unlikely) be harmful to your iPod since no control circuitry exists, but it’s doubtful anything bad would happen. 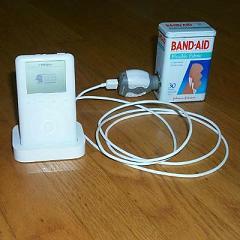 Here’s one more truly unique ipod battery charger. 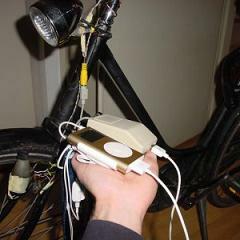 This project was created to harness the power of a person bicycling to charge an ipod. The project write-up has a detailed walk through of how it was created & how it works. 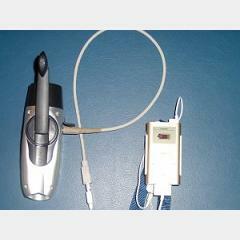 This article points you in many different directions for mobile Ipod battery packs. 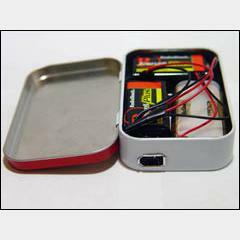 Some of the battery packs are commercial, others are homemade and use standard AA batteries. Overall, if you’re an Ipod & DIY lover you won’t want to miss this article as a mobile battery pack can save you from hours of boredom. 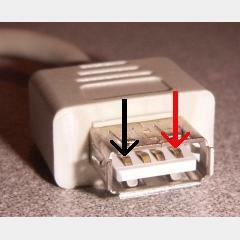 This is a very simple write-up that details how to make your own USB charger for your I-Pod. It’s actually not very complicated but the procedure must be done delicately so that no wires are crossed. The write-up is in depth and has lots of pictures to guide you, so take a look.